Dry to moist, sometimes swampy, deciduous forests and thickets (including oak-hickory, beech-maple, very rarely pine). All gradations from glabrous through lightly to strongly pubescent leaves occur in V. sororia. The spring leaves equal or surpass the flowers. If the characteristic oblong-rounded sepals and ± obtuse short leaf blades of V. sororia are not clear enough to distinguish it from V. affinis, it may help to remember that pubescent plants of the latter (which may, of course, may result from hybridization with V. sororia) should have the spurred petal at least lightly bearded. Occasional plants of V. sororia with more acute sepals than usual may represent hybrids. Glabrous plants of V. sororia differ from V. cucullata in having shorter peduncles and poorly developed sepal auricles (which are relatively large in V. cucullata, especially as the fruit matures). 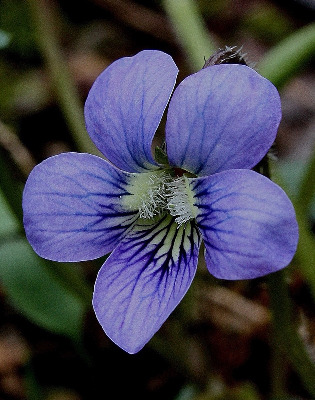 Gil-Ad (1997) recognizes a more northern Viola septentrionalis, best characterized by seed and capsule characters, plus having hairs on the spurred lower petal (as in V. affinis). MICHIGAN FLORA ONLINE. A. A. Reznicek, E. G. Voss, & B. S. Walters. February 2011. University of Michigan. Web. 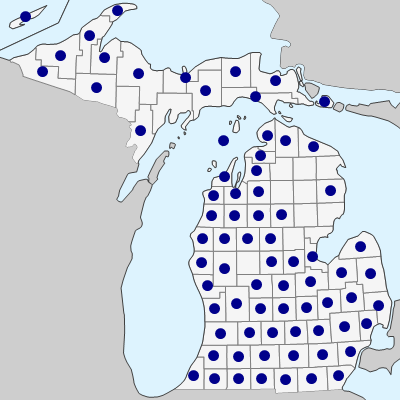 April 21, 2019. https://michiganflora.net/species.aspx?id=2798.